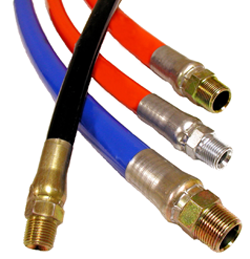 Sewer & Drain Jetting Hose is available from 1/8″ to 1-1/2″ in pressures from 2500 to 5000 PSI with a slick urethane cover to slide easily into sewers and drains. Small diameter drain cleaning (lateral line) hose is available in 4000 Green or 5000 PSI Red, from 1/8 to 1/2 inch diameter in long length assemblies. The inner tube of all Piranha® brand Sewer Cleaning Hose is yellow as assigned by WASTEC. If your hose layline has rubbed away, you can identify the manufacturer by the color coded hose tube.